The Bluebelt Coalition is working to reduce pollutants from entering Aliso Creek, such as at this storm drain in Aliso Viejo. The Laguna Bluebelt Coalition, known as an advocate for marine conservation and its annual ocean photo contest, is expanding its mission inland. Five Bluebelt volunteers may soon be spending time at the Briarglenn developments near Moulton and Aliso Viejo Parkways in the city of Aliso Viejo. Their task will be to give recommendations for professional services in updating sprinkler systems and making landscaping less thirsty. In addition they will prepare outreach materials like door hangers and post cards to alert homeowners of excessive water usage. They are also planning workshops and a flyer campaign. Bluebelt volunteers will act as “advisors” to the Aliso Viejo Homeowners Association under a new pilot program to reduce upstream pollutants from entering Aliso Creek and flowing downstream to one of the most popular recreation spots in Laguna Beach. The creek mouth empties at Aliso Beach, south of the highly rated Montage resort and site of an annual international skim boarding contest. Bluebelt will receive a $12,000 grant from the Moulton Niguel Water Districtfor the initiative to reduce contaminated runoff into Aliso Creek from golf courses, greenbelt roadways, parks and homes. Over irrigation sends fertilizers, chemicals and road contaminates into creeks that flow to the ocean. The aim is to reduce by 10 percent the 3 million gallons a day of runoff that spills from the creek in the dry season across the sand of the county operated beach. To do so, the coalition has entered an agreement with the county, the cities of Mission Viejo, Aliso Viejo, Dana Point, Laguna Niguel, Laguna Hills and some non-profits to educate and incentivize homeowners and homeowner’s associations to prevent water from leaving their property. 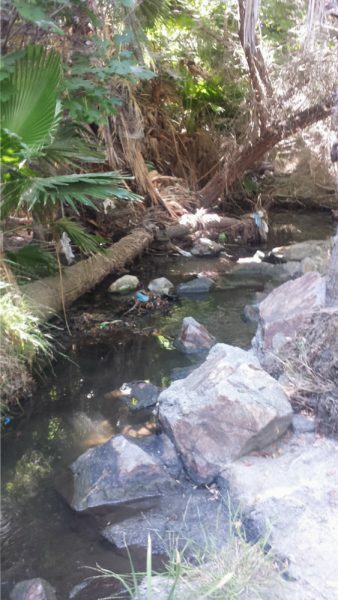 “This is not a water conservation program,” said Bluebelt member Jinger Wallace.“Laguna Beach is not involved in the collaboration because no runoff from our community goes into the creek,” she added. Aliso Creek and its watershed run through a semi-arid habitat of limited rainfall for most of the year. Where the stream meets the ocean, beach sand builds up to create a lagoon. “Too much creek water ‘drowns’ the environment, sending inland water and trash pollution each day to the ocean, while too little water causes dehydration and dry creek beds,” said Mike Beanan, a Bluebelt co-founder. The estuary and sand berm provide a habitat for protected species such as the tidewater goby and southern steelhead trout. Funding from the grant comes from fees charged to Moulton Niguel customers who exceed their water budget, which also funds other water district conservation programs and rebates, said Drew Atwater, Moulton Niguel planning director. Bluebelt Coalition members for years have also advocated for a reduction in discharges offshore Aliso Beach that originate in the Aliso Canyon Coastal Treatment Plant. The plant treats up to 6.7 million gallons of sewage daily from Laguna Beach, Emerald Bay and Dana Point. A dispute over paying for plant upkeep is the subject of a lawsuit filed against Moulton Niguel last May by Laguna Beach and South Orange County Wastewater Authority. The plant shares a boundary with the Aliso and Woods Canyon Wilderness Park. Lack of repairs, court records from Laguna said, could lead to infrastructure failure and risk of environmental contamination. Mediation in the legal matter is underway, but a court date in the case is scheduled for October, Atwater said. The Bluebelt collaboration aims to curb urban runoff by identifying communities that are contributing to the problem and urging these customers to use water more efficiently, Atwater said. Though individual water usage information remains protected, aggregated district data provides insights that can guide efforts, he said. For instance, that information along with runoff measurements by OC Public Works identified the storm drain in the Briarglenn area as a probable first target for the pilot demonstration project due to its high volume of runoff.The Bluebelt hopes to have a report on the results of the pilot program within three to four months. “Each of the Memo of Understanding signatories has their own network and marketing channels to educate the public, and collaborating to share and expand on the message will be more effective than working separately,” Atwood said. While the collaboration aims to coax consumers into good behavior, water districts now can also punish water wasters. In January Gov. Brown signed Senate Bill 814, which allows local water suppliers to issue fines for hosing driveways or washing cars.